Original Schott NYC IS674MS Leather Flight Jacket in Size 36, EUC! SCHOTT 689H Horsehide motorcycle jacket size 54. Excellent condition. Armpit to armpit is about 25", center back neck seam to far end of ribbing is 25", top of shoulder at seam to end of wrist is a scant 25". This is a Schott Leather bomber style coat. It's brown with a dark brown faux wool liner around the collar and a natural faux wool color on the inside. The jacket is a bit older and is nicely broken in. Schott Perfecto motorcycle jacket in excellent condition. Three pockets in front with zipper closure. One inside with snap closure. C&C zipper cuffs. Zip out lining gone. Heavy duty YKK zipper in front. Center rear base of collar to bottom of jacket: 23.5". Up for sale is a schott 664 retro cafe racer jacket in size L. Jacket is in excellent condition, broken in perfectly from a smoke free home. Jacket is lightweight cowhide and fits snug, the L fits more like a Medium. Aethetics of the jacket are the shoulder caps and the racing stripes on the left side. Great jacket! Jacket is LIKE NEW. It is in excellent condition. Heavyweight 3 oz. steerhide leather. Water-resistant leather finish. Rider inspired 25" length biker jacket. Attached half belt with heavyweight nickel plated square buckle. Schott mens leather vest Medium, NYC Very Good condition. Condition is Pre-owned. Please see picture for measurements and condition. This vest is in very good condition. Some of the buttons are worn a little and there is some very slight wear at the leather edges near the arm pits. There are no spots, stains, tears or scuffs. Made in the USA. Originally from the late 70s or early 80s, this jacket is the gold standard for all leather flight jacket reproductions, built with thick, sturdy cowhide, Talon zippers, soft mouton lining, and tightly stitched ribbing. All zippers intact and working. Jacket has plenty of life left. Schott Leather Jacket Style #141 Fitted Size 42 Cafe Racer. Condition is Pre-owned. Shipped with USPS Priority Mail. Jacket appears black but is a very dark brown, and the liner included with jacket is a dark brown. This is a used Schott Brown Leather jacket size XXL. It's a bit of a slim fit as the Schott Jackets usually are. It has handwarmer pockets and an internal pocket too. It comes from a smoke free home. This jacket is a nice fashion jacket for spring days or a night out. I only ship to the United States. Thanks. No holes or stains. Original Talon zipper fully intact and working. P613s Burgundy Size L Schott Nyc. Horween chrome excel steerhide "Perfecto" jacket, 100% wool buffalo check lining .Condition is New with tags. Shipped with USPS Priority Mail. Schott Leather Jacket 626 - Size M. Th e onlyr ea so n I am s el li ng t hi s ja ck et i s be ca us e I ha ve a no th er one wh ic h I us e mo re. Th er e is p le nt y of l if e/ ye ar s le ft t o put on th is j ac ke t whi ch i s ma de b y Sc ho tt - t he o ri gi na l ma ke rs o f th e motorcyclej ac ke t.
Classic Schott Racer Black Leather Motorcycle Jacket in Horsehide 641HH. Condition is Pre-owned. Shipped with USPS Priority Mail. Free Shipping! Sleeves shortened 2 inches by a Schott Factory leatherworker. 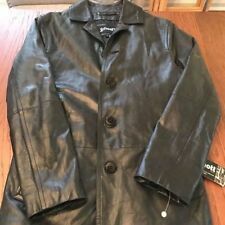 SCHOTT NYC style 650 sturdy Black Military Leather P-Coat Jacket Sz S Fit M. Pre-owned in very good condition Shipped with USPS Priority Mail. Schott CAF1 Perfecto Mens Leather Jacket Size XL in Black Steer Hide Brand New. Condition is New with tags. Shipped with USPS Priority Mail. schott nyc 530 black M leather jacket. Condition is New with tags. Shipped with UPS Ground. Basically a new jacket. Shell: Genuine leather. Sleeves From Shoulder Seams 26". Zippered welt hand pockets. Very very rare SCHOTT NYC 689HMP jacket, made exclusively for MR. PORTER. You won't find another one like this. Great preowned condition, other than the zipper o-rings missing. Measures: - Shoulder Seam to Shoulder Seam: 19" - Pit to Pit: 22" - Shoulder Seam to End of Cuff: 23" - Length: 24" Buyer to pay S/H. No international bids. Thank you! 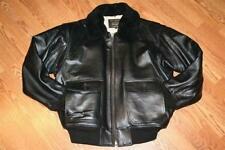 SCHOTT 689H Horsehide motorcycle jacket size 54. Excellent condition. Soft horsehide that is comfortable to wear. Condition is Pre-owned and like new. Condition is Pre-owned. I’m a retired police officer. Towards the end of my career I spurged and bought a premium police coat - very warm as I worked in Illinois. I took the badge holder off (picture) and other than the stitching holes it’s in very good condition. Pre-owned and in good condition. Wear & tear (if any) will show in pictures! Schott PERFECTO steerhide leather double motorcycle jacket #618 42. The condition is very good. 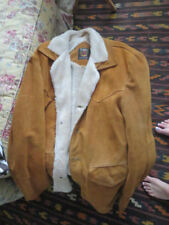 Schott NYC Vintage Buffalo Leather Trucker Jacket W/ Genuine Sheepskin Collar M. Shipped with USPS Priority Mail. Purchased new from certified retailer, worn only once. In essentially brand new condition. Schott Perfecto 519 Size M Black Leather Biker Motorcycle Jacket. The jacket is preowned but only worn twice. Supple black leather. I had the stars on the epaulets removed as it looked more sleek without them. You can purchase the stars for $20-$30 if you really want them on the jacket. High quality jacket made in the USA. Will last a lifetime. Shipped with USPS Priority Mail. Superb condition, Only very minimal wear to leather, Lining good condition. Superb clean jacket. This is a Schott horsehide brown leather jacket from the 50’s or 60’s. All zippers work nicely along with buttons. Legendary Products, Black Stallion, front quarter horsehide leather motorcycle jacket. Do you need a Schott USA, D-Pocket, Horsehide leather jacket in near new condition?. 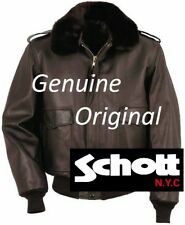 Made by Schott in New York, USA. Great jacket in perfect shape size 34. Everything is in working conditions, no rips or tears. You would look manly in a jacket like this. A real girl magnet. 22" Chest (Underarm To Underarm). 23.5" Length (Bottom Of Collar To Bottom Seam). 25" Sleeve (Shoulder To Bottom Of Cuff). 20" Shoulders (Shoulder To Shoulder).